Two of the top teams in the SEC will square off on Tuesday night when No. 19 LSU visits No. 5 Kentucky at 7 p.m. ET. The Wildcats are eight-point favorites, while the over-under for total points scored is 149 in the latest Kentucky vs. LSU odds. The Wildcats have won 10 consecutive games after losing to Alabama to start conference play, while LSU has reeled off back-to-back victories after being upset by Arkansas on its home floor. However, in a heated matchup between two top-20 teams, anything can happen, so before you make your Kentucky vs. LSU picks for Tuesday's showdown, be sure to check out the top college basketball predictions from the proven computer model at SportsLine. The model, which simulates every game 10,000 times, has raked in the winnings for those following its picks. 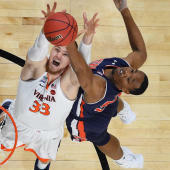 Over the past two years, the SportsLine Projection Model has returned more than $5,200 to $100 players on its top-rated college basketball picks. It also enters Week 15 of the 2018-19 college basketball season on a blistering 99-67 run on top-rated college basketball picks against the spread. Anyone who has followed it is way up. Now, the model has studied the Kentucky vs. LSU spread from every angle and crunched the numbers. We can tell you the model is leaning toward the over, and it also has generated an against-the-spread pick that hits in over 50 percent of simulations. That pick is only available at SportsLine. The model knows the Wildcats have won 10 consecutive games. Kentucky will need another dynamite performance from sophomore forward P.J. Washington if the Wildcats want to keep pace with Tennessee atop the SEC standings and NCAA Tournament bracket. Washington has been stuffing the stat sheet in recent weeks, averaging over 20 points and nine rebounds in his past five outings. His play on both ends has helped Kentucky cover seven straight SEC games, and the Wildcats' defense has been impressive. In fact, they've held their opponents to 55 points or fewer in four of their past five conference games. But just because the Wildcats have been playing extremely well lately doesn't mean they can cover the Kentucky vs. LSU spread. The model also knows the Tigers will need a big game from senior guard Tremont Waters. The 5-11 senior leads the team in points (15.7), assists (6.1) and steals (3.0), and he's coming off an impressive performance against Auburn on Saturday that saw him record 19 points and 10 assists. Waters' vision allows his teammates to get the open looks they need to knock down shots on a consistent basis. In fact, the Tigers have scored at least 83 points in four of their last five games on the road. The Tigers have also had massive success on the defensive side of the ball. LSU forces 16.27 turnovers per game, which ranks third in the SEC. Plus, the Tigers are 7-3 against the spread in their last 10 games road games against Kentucky. So who wins LSU vs. Kentucky? And which side of the spread hits in over 50 percent of simulations? Visit SportsLine now to find out which side of the LSU-Kentucky spread you should be all over Tuesday, all from the model that has returned more than $5,000 to $100 players the past two years.